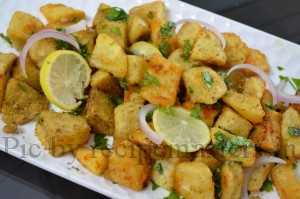 Cut the potatoes into cubes. Parboil them, drain and keep aside to cool. When cooled, sprinkle little red chilli powder, salt and the cornflour. Toss well and deep fry in hot oil till golden and crisp. Remove on absorbent paper. 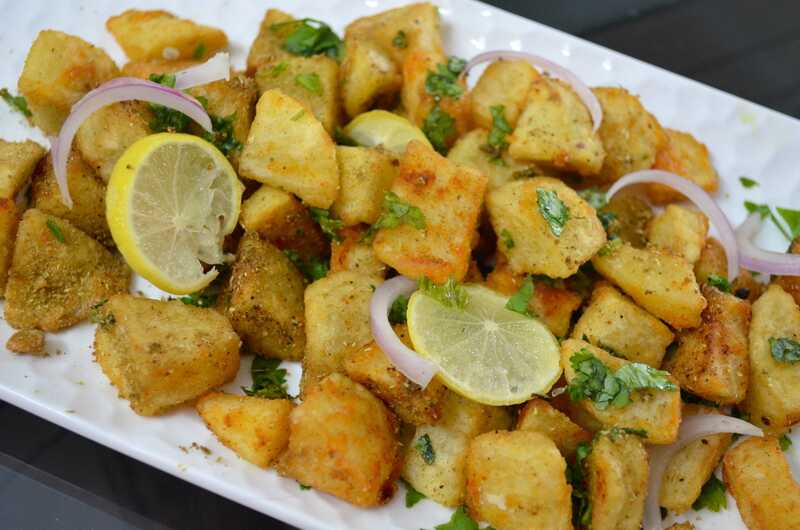 Take the crisp fried potatoes in a mixing bowl, sprinkle cumin powder, coriander powder, dry mango powder, chat masala, coriander leaves, chopped chillies , green chutney (if using) and lemon juice. Toss well till all the pieces are coated well with the masalas. Transfer to small serving bowls and serve garnished with sliced onion and lemon wedges.